She's often depressed. Her life is not as she would ever have wished it. She's filled with the frustration of not being able to use her legs, and not even being able to walk across the room and straighten her own bedding .....when her care giver leaves it all crooked, and catty wampus. And she bemoans her ability to do the hobbies, and crafts she once so loved. She bemoans a lot, it is truly very hard for her, and on her. I listen to her, empathize from my heart, and then I do my best to try to turn it all around. And yes, of course I always share my brother Doug's journey through all these 4 plus months of hospitalization and now waking from the coma, and all of those mental and physical challenges, and my SIL, his wife, Becky's journey through end stage kidney disease and pain and breakage of multiple bones from osteoporosis. But when you are old, and often when you are not even old, you only focus on yourself, your accomplishments, your life right now as bad as it is to you. Knowing that others are worse off does not truly make you feel better off! ..well.....I deliberately flooded her with my doing, instead of bemoaning about her not doing. My purpose was not to flaunt my abilities, or my talents, but to make her realize ..since she already knows this, but still doesn't truly realize it...how much time I spend listening to her complain. I wanted it to click..that I really love her, care for her, and will come and do for here..not in spite of my own life. But because of my own life. And that is the secret to doing.....instead of not doing. Complaining......and yes, I do it, too....only makes us feel all of our aches and pains. I have 32 years of chronic pain under my belt, so trust me I know. Complaining increases our depression, not decreases it. Ask me how I know that? Complaining changes how we feel about our self, others, even our loved ones. All you want to do is go to bed, go on facebook, go on computer games sites, or go on Pinterest. You want to overload your problems with other things you focus on, get involved with, think make you feel better....by doing things that ultimately.....way down the road ultimately..may not really help you feel one bit better about yourself. Ask me how I know? I'm a multiple blogger, right? Care to guess just how much time I spend online doing all of this ..ha! What we do, and how we do it.....must truly have purpose. It must truly help us to feel better what where we are, and what we do, with our lives. If we are creating, if we are learning, if we are trying to do something better...we feel good, we feel better...we are involved in the process of growth and of discovery. About some thing. Some thing that is special and important to us and to our lives. When all we do is feel bad, feel sorry for ourselves, or feel depressed...it grows and grows because we feed it... and feed it well. Suddenly we see the dark side of ourselves, our lives, and it all seems so very bleak and so very hopeless. And yes, been there, done that, too! 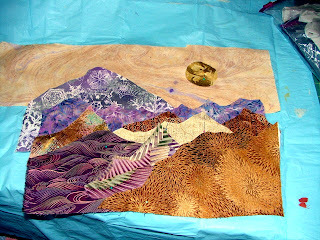 Quilting lifts me up beyond and past and over my self. Quilting is just like gardening, or doing yoga, or singing, or dancing, or being involved in theatre. It creates and involves us with 'right thinking' and "true purpose" with and for those things that we do in our lives. Right purpose fill my life with song. It creates a happy heart inside, instead of a sad, and hurting heart. 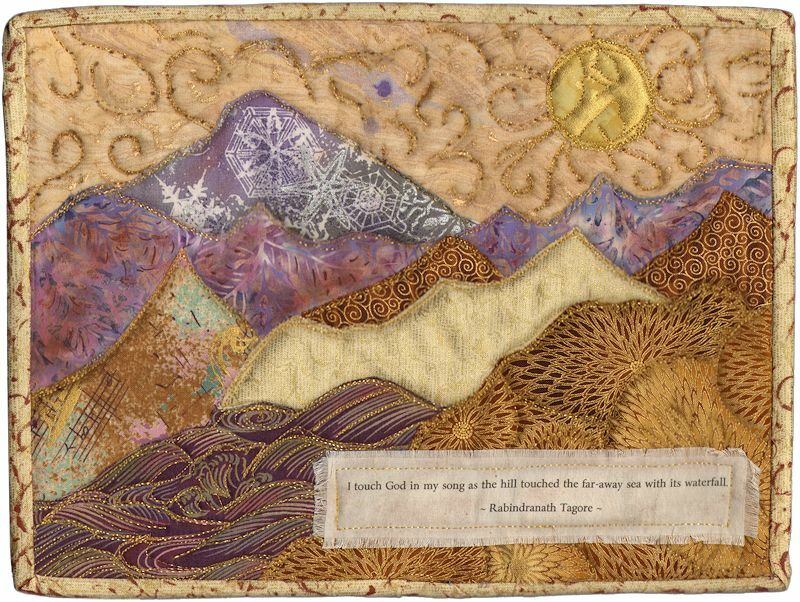 So, this new month...October...a time of changing seasons, changing weather, changing colors...I bring in a new quilt filled with my own personal song...the "Song of the Hills." The song of the majesty of the changing seasons, to a vision of snow on the mountains ahead, but still the flowing waters of our spirits, and the joy filled, and light filled song of our hearts. My newest AAQI quilt that happily made it to auction this month. And I always, always feel so very blessed when that happens because hundreds if not thousands of quilts do not, each and every month. Ami Simms has the challenging task of selecting 26 out of so very, wonderful many. So, gratitude for each and every opportunity to spread my love of quilting, of AAQI, and send forth my loving, and caring, and healing energies, into the world. And boy do I spread it..on multiple blogs, multiple venues, and by writing and talking about it all...a lot ;) But this is part of my own soul's purpose..to do good on this earth..the best that I can, in any way that I can. So, I quilt with heart and soul and spread the energy around by donating my creations... everywhere that I can! And when you bid on one, or buy one of my quilts...you are part of that song. Part of that right doing, and right purpose. For it is for such good, good if not down right great causes. I always know that each quilt will go just where it is meant to go. And if is a money earning quilt, that it will earn the right amount for Alzheimer's research through my quilt sales and my chance to have a quilt up at Auction to hopefully earn extra money that way! And hopefully through my words of the heart as I type on my little (ok very, very long) blog posts. The October Online Quilt Auction Starts October 1st! Yes, this whole long, long post to say..."Take a look at the quilts. Take a second look at my quilt up at auction. And if you have any money to give towards charitable causes this month...please, consider my quilt ;-) And we have been unemployed now for three years, so trust me I do know how that is too! So, every single time one of you is able to bid on or buy one of my quilts I truly, truly, truly appreciate it. I know what it is to give and I know how hard it is to wish you could but can not. Big hug anyway! Thank you for taking the time to visit this blog, for reading my very long posts, and for lifting your own hearts and spirits to connect with mine and so many others. Blessings flow through all of our songs of the hills! Another post on the making of this quilt:Lift Up Your Spirit with the "Song of the Hills"
Dear Songstress of the hills, I loved your post and felt a knowing smile creep to my lips as only this morning I forced myself out of the house with a grumpy head and a weary soul, to honour a promise to help make small advent treats that we sell each year - so that we can buy craft items for the kids school. Within ten minutes of crafting, sharing, with hearts and hands my foul mood lifted and my soul started to feel nourished again. The world, all of a sudden, is a better place..thank you for sharing and caring. I LOVE to read your posts, your family is truely blessed to have you, with your wonderful 'take' on things. Oh, Julie! Listener to the spirit of the hills, and a giving and caring heart of your own. I came up at 4 am wondering if I should delete it or not. Am I getting so lengthy and so personal that I am over sharing and people will only 'run for hills' the moment they see I have a new post? You give me hope that maybe I'll let this one stay! Wonderful post. Your words are so true. I have this little reminder on my refrigerator "Give thanks in all circumstances for this the will of God in Christ Jesus for you". Sometimes we forget and there is no better way to move past yourself than to give to others. Thanks for your reminder today. Good for you - fabulous post. Have just placed a hefty auto-bid on your PQ - fingers crossed! Hug your MIL and remind her that she is NOT alone on the journey. Your post really took me by the heart and shook me up a little. I loved it. I've been hiding out in my house for weeks due to smoke from many fires in WA and asthma; that's the excuse. Truth is I'm no longer caring for my grandkids and helping with their home schooling since they all went back to public school and I'm "out of work," and after reading your post I realized I've been sitting about feeling sorry for myself instead of realizing its an opportunity for something new, many places (inside ones with A/C) need hands. You are an angel. Oh, Celia! This comment brought me to tears. Bless your precious heart! We all get into these tight places and life gets to feeling so hard and we just want to pull the covers over our heads. But listen dear lady, you see it, and you also can do it. Flip those covers off and climb out with your spirit filled smile! You are so much stronger, and better than you think you are and dang, it woman you have so much love inside of you to share. I can sure feel it! You are an AAQI treasure and a joy in my life. Blessing from me to you! Thank you so very much, Jan! Your own spirit of giving and your generosity has contributed so very much to so many causes. You are such a positive influence Michelle, your blogs are wonderful. You're right it is so easy to feel sorry for yourself. It must be so much worse if you're 97! Unlike you I do sleep, far too much in fact some days I'd love to just stay in bed. If I didn't have to look after my granddaughter after school I'm sure I'd feel like Celia. I'm trying to be more pro-active & have volunteered to listen to children reading in primary school. I've also volunteered to teach children to knit in another school. So hopefully I'll pull myself together & do something positive by passing on some skills to children. Might stop my whingeing & feeling sorry for myself. Take care! Forgot to say I love your photograph of the Butterfly Bush. The detail is amazing. Another beautiful and thought-provoking post, Michele. You're right - wallowing just makes us more miserable (ask me how I know!) We need to get outside and over ourselves to get over the bad patches! I love your little quilt and hope it odes well in the auction. Congratulations, again, on making the final cut.